When did you start carving? Although I did a degree in fine art and sculpture, I didn't start carving wood until 1986. The first carving I ever did was of my newborn daughter Holly. It is not a great carving technically - I only had one old gouge and a Stanley knife, but the strength of the design carries it off. I used wood because its character was sympathetic to the subject. Stone or clay wouldn't have been right: too impersonal. It's a carving that people are drawn to and feel the need to touch - hence the darker area on the well patted behind! I show it to my students to illustrate the importance of design. A good design executed with limited skill can still be a successful piece of work - a poor design, even executed with supreme skill, is always a poor carving. What inspired you to carve? What inspired me to continue carving was an Ian Norbury exhibition at his gallery/studio in Cheltenham. Ian's uncompromising and often daring approach to realising his ideas was mind expanding - the opposite of the Hepworth/Moore clones of art school or the mostly 'wooden' carvings of the craft sector. It made me realise that wood can be used in ways I never thought possible. The same thing that has always inspired me - life. A piece of work is an emotional response to visual stimuli, or should be. It is an attempt to communicate your feelings about what you see. As long as you have your eyes and mind open, you should not be short of things to carve. I have a particular interest in music. I played in a ceilidh band for many years and love instruments; we have a large collection and all the family play. A carving should be like a song or tune: telling a story through rhythms, contrasting tones, passages of quiet reflection and points of crescendo. One of my favourite subjects is folk musicians. What are you carving at the moment? I usually have three or four carvings on the go at a time as I find that if I spend too long on one carving, I stop 'seeing' it objectively and the brain starts to accept inaccuracies. Seeing it with fresh eyes after a break, it is immediately apparent what needs to be done. At the moment I have five carvings in play. Of two commissions, one is a shepherd - an addition to a nativity set which I carved last year; the second is a set of church gates in English oak with carved decoration. The other carvings are of a green man, a dormouse in a nest and a quote of Mother Teresa - I really love carving lettering. On the drawing board are a morris dancer and another baby. A cabinetmaker or an illustrator. My grandfather was a master cabinetmaker and I considered that as a career option but art college in the early 70s was more alluring. I have always drawn - it is an essential skill. Drawing is an extension of thinking: just a way of making thought visible. Many students insist they can't draw but carving is just drawing with a gouge. I have illustrated eight children's books and will probably do more but at the moment I find the more physical process of carving more appealing. I have two workbenches. One looks out over our half-acre cottage garden, which keeps us self-sufficient in fruit and veg. There are now 21 fruit trees - there used to be 27 but some turned into carvings! When the blossom is out it's magical. There is also a large walnut and a very large ash. I usually work at the other bench which faces the wall or I would be constantly thinking of all the jobs I should have done in the garden. I live in a small Devon village in the beautiful Otter valley. We have a World Heritage Coast a few miles to the south, Exmoor to the north, Dartmoor to the west and the Blackdown Hills, classed as an Area of Outstanding Natural Beauty, to the east. People say we are lucky, and we are, but it's luck we've worked hard for - 16 hours a day, seven days a week for many years and not much less now. Do you listen to music when you carve? Yes, I am always being told off for having it too loud, although I often listen to Radio 4 if I am doing mundane tasks. I like 'Live' folk recordings but for inspiration you can't beat the Elgar Cello Concerto. Who or where would you most like to carve for? Anyone who genuinely appreciates my work. I would rather give one of my carvings to someone who really loved it than sell it to someone who just wanted a decoration. Which are your favourite tools? Okay, I am a 'toolaholic'. I love them and I have lots, around 300 - all good quality. Some are over 150 years old but have lost only about an inch of steel so I reckon they should be good for another 500 years if looked after. For old tools I prefer Herring Bros, for new tools Pfeil are a joy to use. I do 90% of my carving with half-a-dozen gouges that, I swear, have personalities. They just feel so right in the hand. Power tool wise, I couldn't be without a bandsaw. Do you find yourself critical of your own work? If you're not you'll never produce anything worthwhile. The hardest part of carving is knowing when to stop. I always remember Ian Norbury saying that he would rather go the extra mile and risk ruining a carving than stop short and always know he could have done better. 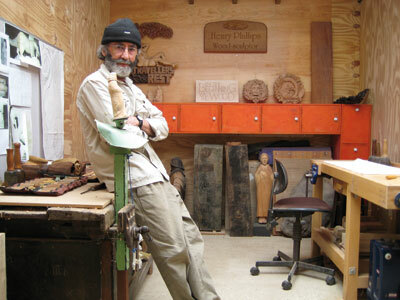 "One of my favourite subjects is folk musicians"
After studying design and sculpture at Exeter College of Art, Henry has been a wood sculptor for many years, and teaches carving in East Devon.